I call BS. The huge “stimulus” package was signed by Obama in February of 2009 that had been passed by the newly elected Democrat Congress, and that added over $800B to the 2009 budget. Not only that. Since the Dems refused to pass any budgets after 2009, the “stimulus” funding became the base for CRAs for the following years. When did the budget first include spending for the wars in Iraq and Afghanistan? Those expenditures were not included before 2009. Right? 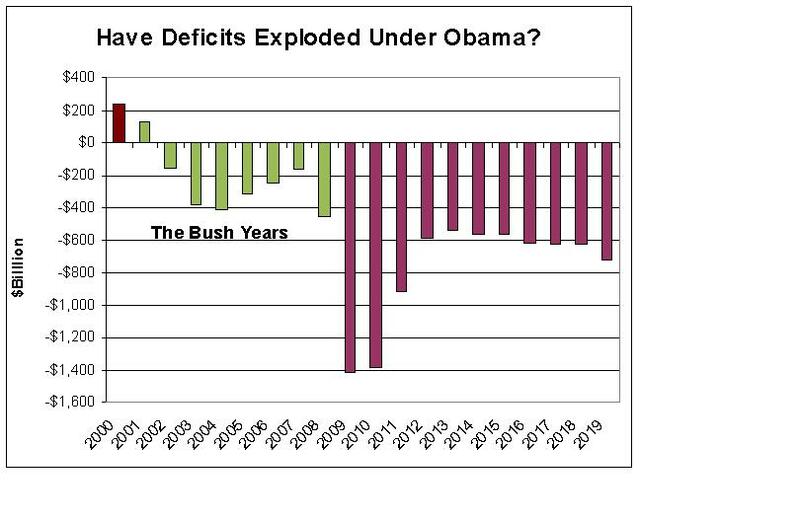 But they were added to the national debt just the same, but never showed up in the deficit until 2009. Mr. Mitchell is incorrect. Spending for the entire FY 2009 was not largely set in place while Bush was in the White House. The Democratic Congress and the Republican President reached a spending compromise on September 30, 2008 with HR 2638. That continued spending at FY 2008 levels until March 6, 2009. The remaining 7 months for FY 2009 was spent according to HR 1105, signed by President Obama. It’s neither Bush’s budget nor Obama’s budget – it’s Congress’s budget. No President can spend a dime unless it is first approved by Congress. The record-breaking deficits of FY 2008 and 2009 were Pelosi-Reid budgets.